The three UN-Habitat Youth Advisory Board Members during the impromptu event. Nearly 30 minutes into the scheduled side event on climate change in cities at the UN Conference on Housing and Sustainable Urban Development (Habitat III), a handful of participants were sitting in conference room R9, dazed and confused, wondering why the event had not yet started. My Canadian colleague from the UN-Habitat Youth Advisory Board, Olivia Labonte, and I peeked inside the room out of curiosity and were told by a volunteer that the event had been postponed. As we were walking away in disappointment, I turned to Olivia and jokingly commented, "You know, we could just take that room and make a presentation about the UN-Habitat Youth Advisory Board and probably no one would do anything." To my surprise, Olivia enthusiastically responded, "That is such a great idea--let's do it." That was when I knew that we were about to do something spectacular. Olivia is not one to say something without taking action, and, surely enough, we marched right back into that room half-committed to the idea of claiming this space. While we were walking back, we ran into our German colleague from the UN-Habitat Youth Advisory Board, Jonas Freist-Held, which subsequently turned us into the Three Musketeers. We entered this space, just when a volunteer was about to officially announce the postponement of the scheduled event and asked everyone to leave. Surely enough, Olivia took the initiative to tell--not ask--this individual that the UN-Habitat Youth Advisory Board would be taking the room to talk about our work. This innocent volunteer, unaware of our mischievousness, spoke to everyone in Spanish and asked them to stay for a special session. Sitting on the panel, Olivia began to talk about the Board, with Jonas, our miraculous polyglot who speaks German, English, French and Spanish, as our translator. 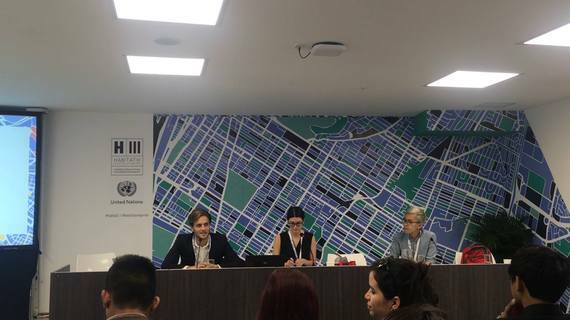 After briefly sharing about us and our work, we opened it up to the floor and asked people to share their own ideas, struggles, and thoughts on urbanization and the New Urban Agenda, the upcoming outcome document of Habitat III. In midst of this discussion, more and more people kept piling into the room until, to our astonishment, all the seats were taken. But the participants in the room were quite homogeneous in mixture: they were all Latin American youth, with only three or so participants able to speak English. 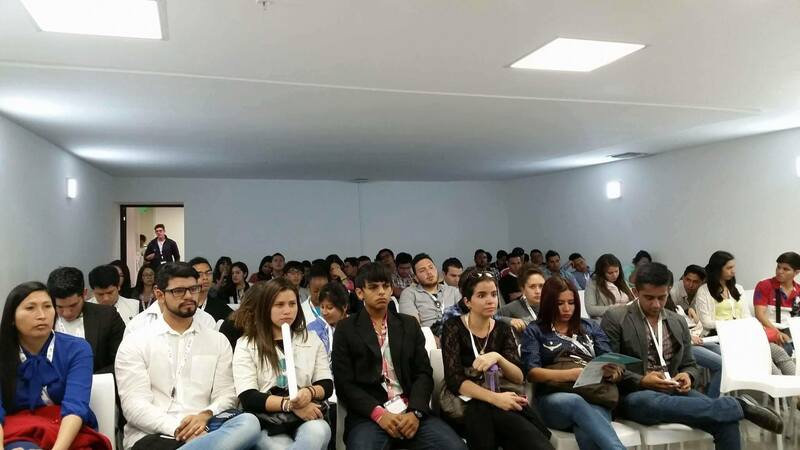 An entire room filled with youth at a pop-up event during Habitat III. When we opened the floor to these youth, they embraced the opportunity and immediately sought to speak. The first youth, from Lima, Peru, commented on the lack of public space in her city. And before we know it, all these young people began to comment on the lack of public space. They spoke throughout the 20 or so minutes that we had, until an organizer realized what had been going on and turned off the lights. Even then, the room suddenly began to radiate with the glimmer of all these youths' camera lights from their cellphones. What happened later amazed us even more: all these young people began to rush up to us to continue the conversation, with their phones to light up the space. Many of these youth stayed 20 minutes passed the event, until we were eventually kicked out by the next panel. Youth still speaking with UN-Habitat Youth Advisory Board Members even when the lights were off; flash had to be used to take this photo. It was a shame that we had such little time, but this brief hijacking event taught me many things. When not given a space for dialogue: take it. 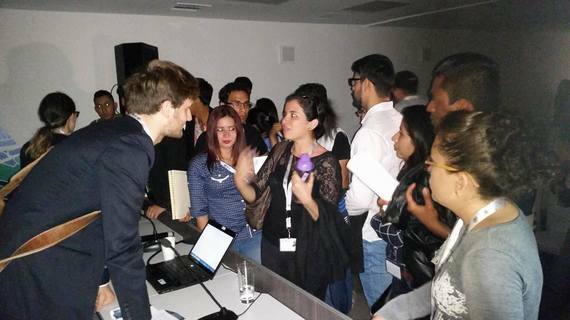 The outcome of this event showed that youth in Latin America were not given an official or sufficient space for participation; otherwise, they would not have been so enthusiastic and engaged in our impromptu shenanigans. But from a more personal perspective: if you have an idea in mind that challenges the establishment for the common good, follow it. Having an idea often means that you already articulated half the reasons. Our actions took the form of pop-up urbanism, otherwise known as tactical urbanism. We claimed and appropriated a private space, conference room R9, for benefit of others. It showed that spontaneity and quick action can result in tremendously positive outcomes. If anything, this event was a reminder of what young people should be doing: making space and empowering other youth for the betterment of society.